Launched in 2007 as Omnivoracious (“Hungry for the next good book”), the Amazon Book Review has served as the place for the Amazon Books editors to talk about our passions for fiction, nonfiction, cookbooks, kids’ books, mysteries, romance, and science fiction. Here you’ll find interviews with your favorite authors, Best Books of the Month announcements, reviews, and occasional essays on books, reading, and quirky trends. Visit us often for new stories, or have the latest ABR articles delivered to your in-box via our daily digest email. It's hard to believe but one of the most beloved children's books, The Very Hungry Caterpillar, is having its 50th anniversary today. 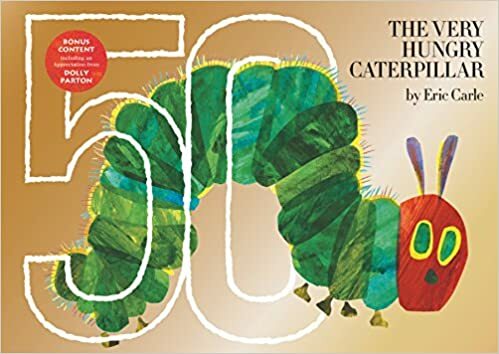 Eric Carle's story of a ravenous caterpillar who munches his way through leaves and fruit, culminating in his transformation into a beautiful butterfly, has become a modern classic and sold millions of copies. The 50th anniversary edition features special bonus material, including a new introductory letter from Eric Carle and images of Carle's original sketches for the book. Below is a short video from the author about why he thinks this particular story has stood the test of time. You'll also find a couple of photos of Carle the year he wrote The Very Hungry Caterpillar. Happy anniversary to one of the best. © 2012–2019 Amazon.com, Inc. or its affiliates. All rights reserved. The Amazon Book Review logo, Omnivoracious, and Hungry For The Next Good Book are trademarks of Amazon.com, Inc or its affiliates.